You are currently browsing the Suburban Homesteading – Frugal Living blog archives for February, 2013. It’s shocking to think that 50 million people, many of them children, go hungry every day. It’s even more shocking when you learn that almost ¼ of food produced in America goes to waste. From the Directors of FOOD, Inc., Kristi Jacobson and Lori Silverbush examine the food insecurity issue through the lens of three people who are struggling to feed their families—a single Philadelphia mother who grew up in poverty and is trying to provide a better life for her two kids; Rosie, a Colorado fifth-grader who often has to depend on friends and neighbors to feed her and has trouble concentrating in school; and Tremonica, a Mississippi second-grader whose asthma and health issues are exacerbated by the largely empty calories her hardworking mother can afford. Woven together with the insights of experts, A Place at the Table will show how hunger poses serious economic, social and cultural implications for our nation, and how it could be solved once and for all, if the American public decides-as they have in the past-that making healthy food available and affordable is in the best interest of us all. As farmers, gardeners, homesteaders and foodies of all kinds we know all too well how simple changes can improve a family’s food security and self-sufficiency. I hope you will take time to watch this must see documentary…and then decide how you can be helpful in your community. Our flock of chickens grew this week. Four new arrivals, 2 Welsummer and 2 Blue Wyandotte pullets were added to the coop. I hadn’t really planned on adding more hens this early, but when I realized some of my girls were getting on in years, slowing down their egg production, and my friend and chicken breeder Larry had 3-month old’s in the breeds I was thinking about, the plan sped up by a few months. I’ve never really been interested in the plain production breeds like Leghorns, Barred Rocks or Rhode Island Reds. I want hens that are colorful, not only in their feathers, but also in their eggs. I already have Americana’s that lay blue-green eggs, and Black Cochin’s and New Hampshire’s that lay light brown eggs. The only thing missing was a breed that lays the dark chocolate brown eggs, like those Cadbury chocolates wrapped in shiny gold paper. 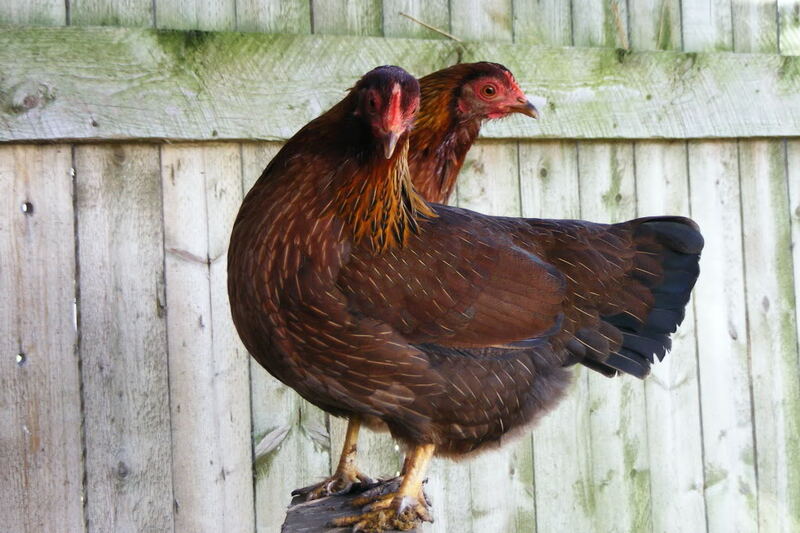 There are only two breeds that lay such dark brown eggs—Marans and Welsummer’s. Marans tend to be a little pricey for egg layers and relatively hard to come by, but Welsummer’s are more common. They are a Dutch breed…a combination of several breeds really. But, over time they have been refined and standardized by poultry breeders who took a fancy to them as soon as they were imported. Through selective breeding they have become a nice temperate addition to farm flocks, and the dark brown eggs they lay are an added bonus. 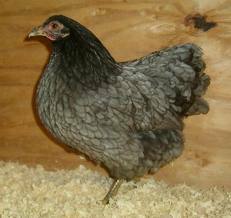 The Blue Wyandotte is a variety of the Wyandotte breed, meaning they are a “color” of the breed. Wyandotte’s come in a several different colors from golden and silver laced, to white, black and buff. There are even Columbian, partridge and silver penciled giving any poultry lover a wide range of colors and feather patterns to choose from. Wyandotte’s are an American breed used for both egg production and meat. Although I like them for their solid medium brown eggs, I also think they are just what a chicken should be…plump, fluffy and fun to watch scratching in the garden. Right now they are housed in six foot long wire caged that was used when we raised meat rabbits. 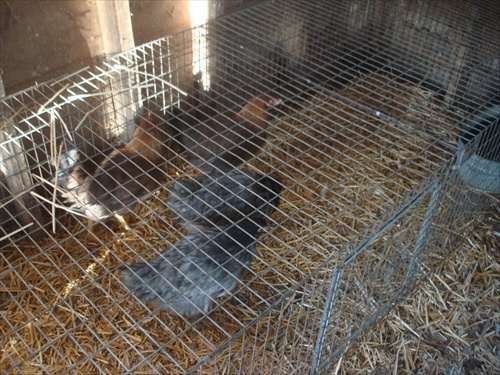 The cage will keep them safe at this young age, away from circling hawks and feral cats, and allow the other chickens to get use to new additions. Although I don’t think Sophia (our goose) is to keen on the idea of more chickens in the coop. So…in a few months the flock will add a wonderful dark brown color to my daily collection of farm fresh eggs. Breakfast can’t get any better than that! On Ground Hogs Day, Punxsutawney Phil can out of his burrow, looked into the bright sun and signaled that spring would come early this year. But, with massive blizzards in the northeast and record lows in the west spring seems a long way off. Although the temperatures have been low in my area the sun sits high in the sky shining down like it would on a warm April day. With weather like this I can’t help but wish, dream even that I could get outside and work in the garden, but with the temps barely above 50 gardening outside just isn’t possible. So, like any die-hard gardener I have ways to bring spring to me, in my own way. I spent last night by my fireside, sorting and taking inventory of my seed box, arranging them by roots, fruits and leaves; making lists of seeds to buy and planning out the garden beds. 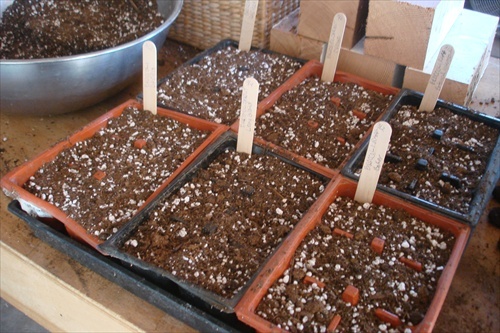 Many of my seeds can be started indoors, well before spring arrives, and that’s how I can make spring come to me. Today I spent the afternoon mixing soil, filling starter pots and flats and planting seeds of herbs, cucumbers, peppers, onions, leeks, cantaloupes, watermelons, cucumbers, squashes, tomatoes, head lettuce, cabbage, broccoli, cauliflower, and annual flowers. The plastic lidded “to-go” containers my family saves for me make perfect little greenhouses, keeping the soil inside warm and damp so life can begin beneath the surface. In a few weeks green things will be growing and by the time the weather changes, for the better I hope, they will be ready to set out in the garden. I can hardly wait.